*The book giveaway! Would it surprise you to know that I received over 700 email entries for my scholarship book giveaway? It's true. I will be sorting through them today (thank you, Gmail filters!) and sending notifications to the winners. *I have a book trailer! It's very Bewitched-inspired. Love twitching whiskers on Henry. *Also: a new Creativebug course! This one shows you how to make a 40s-inspired peasant dress from the Portrait Blouse pattern from my book. (The pattern is included as a PDF printout with the course.) Don't forget that until the end of October, you can get $10 off a Creativebug membership with the code GERTIE10. *Here's the sample dress I made for the Peasant Dress Course. In the course I show you how to elongate the Portrait Blouse pattern for a dress, add gathers at center front and back, add rows of elastic at the waist (my method uses channels rather than elastic shirring thread), baby hems, and a delicate little bias binding at the neckline. *If you'd like to see a video of me walking around San Francisco in the Peasant Dress, you're in luck! *Creativebug is also doing a fab giveaway for my book and a three-month membership. Once you enter, you get my waistband finishing class for free! *I'll be working on a coat sew-along post today, so watch out for that later on! Love the trailer - and love your book too, obviously! That's a super-pretty dress! I love the pink. Love the trailer and the dress. 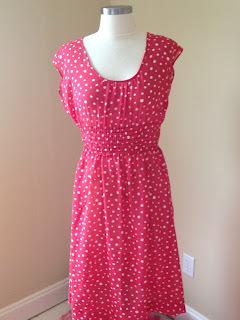 Also wanted to tell you that I'm just finishing up a bombshell dress, and am loving the result. Thank you for a wonderful course. And I had to laugh, because this was my first lapped zipper and and first time pick stitching anything and I can definitely see the attraction of both. I used your book for the pick stitching instructions, which are excellently done. I learned so much making this dress, and am very glad I took the course. Is there any chance you'll do more? The Craftsy platform turns out to be an excellent setup for snail paced sewers like me. I'm also enjoying the coat sew along posts. I'm not joining in this round, but bought the pattern and am eagerly reading the posts so that I can make it in the future. Best! Crazy stuff. I live around the corner from Stuff and Thangs. It makes me giggle every time. Love the trailer Gertie. Can't wait to get my hands on your book, I'm saving up! That looks like my kind of shop, I am sure they appreciate the plug. Question about the Waistband finishing class. I didn't have time to view it when I entered the giveaway. Can I view it now somewhere (and still get it free?) Thanks! I love your trailer! I swear you're in my old neighborhood -- what district are you walking in? Hello Gertie, I live in England and tried to order your book last week, they said the printers are temp out of stock, he says it look like demand is more than they originally thought it would be so they have to print more. Congrats to you. 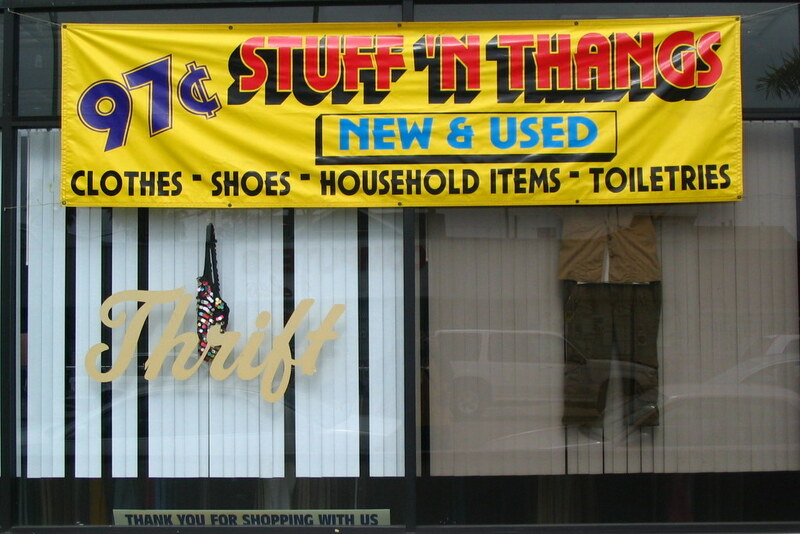 I used to live a few blocks from Stuff N Thangs (still in San Diego, but different area). I say "stuff n thangs" quite regularly when referring to miscellaneous things as well. Funny! 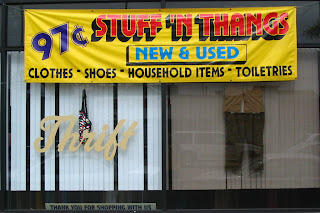 I went in there once, it is the most pointless thrift store ever. Anyway, I got your book last week and have been really enjoying it, thank you! love the peasant dress! I'm joining right now. Great job on everything the book, the classes, the blog, etc. Big fan!! Where is the link for the giveaway? Whoops! The text is updated with a link. Oh that book trailer is so cute! I just got your book and I've been sneakily reading it at my desk when I should be working ;). It's great and I cannot wait to make some of the patterns. You are such an inspiration to me! !